I’ll admit it: I don’t follow the PBA. I used to. My dad’s younger brother, Rey Pages, used to play for the Crispa Redmanizers together with Bogs Adornado, Atoy Co and Philip Cezar. My all-time favorite player is Allan Caidic. I recall, back when we lived in Bacolod and basketball was my sport in elementary, watching Caidic (then with UE) score a dozen three-point shots—just like Chester Cokaliong would today. Last Sunday night, I watched the PBA. On AKTV, the PBA All-Stars played Gilas Pilipinas. 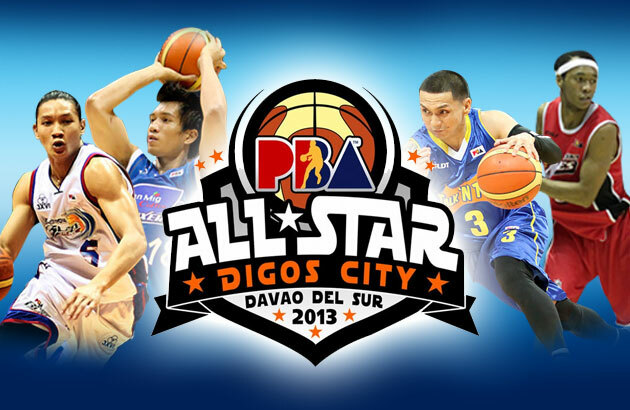 The venue was Digos City, Davao del Sur and it was the 2013 PBA All-Star Weekend. Junemar Fajardo: it was terrific to watch him play for Gilas. We used to watch him at the Cebu Coliseum—now, he’s a giant in the Philippine Basketball Association. The other night’s game wasn’t the only show inside the Davao del Sur Coliseum. There were plenty the whole week: the Obstacle and Trick-Shot competition; the 3-point shootout, the Greats vs. the Stalwarts game; and, of course, the highlight: the Slam Dunk event. Chris Tiu was unbeatable in the 3-point contest. In Round 1, he shot 4 out of the 5 “last balls” (which award two points) and scored 17 — the same number as his jersey. In the final round, he disposed of all with a score of 21. Slam dunk? I watched the replay and they were spectacular. As if slamming the ball inside a hole that’s 10-feet-high isn’t already difficult, the five PBA stars who joined were acrobatic. With the PBA All-Star game itself, what I like about these games—patterned after the NBA, of course—is they’re high-scoring. There’s less defense and more dunks. Talk about high-scoring, would you believe that last year, the score was 176-144. I didn’t watch that game (held in Ilocos with James Yap as the MVP) but what an offensive barrage when both squads totaled 320 points. Last Sunday, I watched the last two quarters of the All-Star game between Gilas and the All-Stars squad. It was exciting and got even more exciting in the last minute. With 15 seconds left in the game, thePBA All-Stars led, 122-119. They were going to win. But, wait—Gilas stole the ball. Castro then scored on two free-throws. Next, JV Casio was fouled and also sank his two free-throws. Score: 124-121. Time left: 13.7 seconds remaining. Then, with 7.6 seconds left, a funny thing happened after a three-pointer was attempted: the ball got stuck in-between the ring and the fiberglass board. Jump ball! Then, with a few ticks left on the game-clock, Jeff Chan of Gilas faked a shot as the defender flew; he then unhurled a three-point shot. ALL-STARS IN CEBU? I checked Wikipedia and found out that the PBA All-Star Game started in 1989. In that very first All-Star Game at the ULTRA in Pasig, the Veterans defeated the Rookies-Sophomores-Juniors team, 132-130. Guess who the MVP was? Our own, Elmer “Boy” Cabahug. In its first 10 years, they held the weekend in Manila. But, in the year 2000, the venue was the San Agustin Gym in Iloilo City. Since then, majority of the All-Star games have been outside Manila. Cebu? We hosted only once, in 2004. Asi Taulava and Jimmy Alapag were declared co-MVPs in that game at the Cebu Coliseum. After Cebu, the hosts have been Laoag, Cagayan de Oro, Baguio, Bacolod, Puerto Princesa and, two years ago, in the tourism capital of our nation: Boracay. Isn’t it time to bring back the PBA All-Star Weekend to Cebu? It is. Since it will be 10 years next year since we last hosted, it’s about time. The question is: Where? The best Cebu gymnasium? The under-utilized but excellent venue in Lapu-Lapu City called Hoops Dome.